You’ve got a chair; you’ve got a desk; what else does your New Orleans office need? Accessories are a must when you are trying to impress, so stop and think for a moment about what you want to get across when someone walks in and how to get it across on your budget. If flooring is a bit scuffed, a new rug can make all of the difference. Buying a used one and having it cleaned is a good options if you can’t drop a grand on a new Oriental – but go for something that won’t show stains if anyone tracks dust or dirt or mud into your office. A designer rug centered in front of your executive desk can make a terrific first impression. Artwork for the walls is another must. In addition to any business certificates, college degrees, etc – you can have simple prints by well known authors matted and framed or even go local for some New Orleans art that complements your space and supports your community artists. Lighting, if not built in and wired to go, should be bright but not too direct. Consider well placed tall lamps on the floor and a few smaller ones on side tables and fool around until the lighting is perfect. Don’t go for fussy and ornate – lamps attract dust and cleaning them should be easy. Switch out shades every year and get a whole new look. Seating for guests should be comfortable and attractive. Go for a small couch or chairs with a fairly short seat depth and a cushioned but not overly soft seat so visitors don’t get lost when they sit down and require a crane for extraction. If your office may have clients come in with their children, have a children’s corner with appropriate quiet toys and books and a small table and chair setting. If you have a large reception area, a television with cable service is a good idea. This can help distract clients from their wait and add to the ambiance of the room. A plant is also fine, but pick something easy to care for! Overall, your accessories should complement your office, not overwhelm it. Are you getting a startup off the ground in New Orleans? Office furniture is a must, but when do you depend on thrift store finds and cast-offs from friends and when do you really buckle down and buy the high quality, gorgeous office furniture you’ve always dreamed of? Of course, you have to consider funding and prioritize first. Once you find and secure office space, take a good hard look around and see if you must do any work in it to make it workable. Do you have to allocate funds for customizing the space? Rewiring anything? Adding indirect lighting? It might be cheaper, if you are having an inner build done, to have lighting done as part of it and not have to purchase alternate lighting afterwards. Once the space is ready, you can consider essentials. Your employees and clients need to conduct business. This means you need basics. Lighting (which you may have already taken care of), desks, and seating. The problem with thrift stores is that you end up with a rather undependable mish mosh of colors and styles. Try outlets for used New Orleans office furniture instead, that way you have a chance of getting several sets that at least look like they go together and will be more modern in style. Look for quality of jazz, and quality over quantity – a large, well made desk can double as workspace for two instead of buying cheap small desks! Once you have the funds to really outfit your office properly, then you can purchase better New Orleans office furniture. Always choose with an eye to easy mobility if you ever plan to move offices, easy expansion for the time when you need more workstations, and comfort on the part of your employees and clients. Don’t over-splurge on accessories at first – if you don’t have a decent desk you definitely don’t need an aquarium – but when you can afford it it’s the details that make the difference. When your business passes startup phase and is well established, you can look to upgrade your new Orleans office with furniture and accessories to make it really pop! Welcome back to the the New Orleans Office Furniture Options series! Last week we looked at the various types of desks you can choose from for your New Orleans office. This week we are speculating on the various chairs that are available for your office. First, there is there standard desk chair. Base, four or five wheels sticking out in a starfish pattern, cushioned seat, and cushion or web back. These chairs may be fine for starters, but expect to have to replace them soon as they are not that durable and definitely not very comfortable. Your employees health and comfort may well depend on the quality of the chair they sit in for 8-10 hours a day, so think about employee retention when you buy things like office chairs! Next, there is the executive chair; it is usually high quality leather and may or may not be rolling. Everyone remembers the infamous boss’ chair in the move Nine to Five – seeing that thing tip over backwards made for laughs in the theater, but it’s not so funny when you are the one going over backwards, cracking your head and seeing the twittering birds circle above you (and wondering later if your secretary dumped rat poison in your cuppa joe!) Make sure you get something both comfortable and professional looking. Finally, there’s the chair of all chairs – reception. Making your consumer base uncomfortable is NOT a good plan, and cheaping out in reception is a sure fire way top ensure your clients are disgruntled if they have to wait for any period of time,. Look for comfortable chairs and provide a variety – some short seated and high backed, others large and plush. A few benches will not be amiss for those with children in tow or a large briefcase. Office chairs are definitely an important item of New Orleans Office Furniture, and you should search for just the right pieces to ensure the comfort of both visitors, employees and management. Choose wisely and you won’t have to replace them annually, meaning better profits in the long run as well as happier staff and clients! 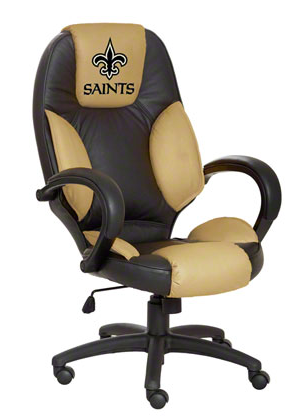 Purchasing New Orleans office furniture starts with your desk. What kind do you need, what kind do you want, and what kind meets all of your desires while fitting in your space? The price tag is just the beginning – you’ll need to consider the pros and cons of L-shaped vs U-shaped, and explore storage options and data capabilities. What size desk is best? Buying a desk based on all factors EXCEPT size can lead to embarrassment on move in day when the desk won’t fit the space and you end up looking like an egotistical idiot. Take proper measurements of your workspace (triple check) and make the size one of the main criterion when choosing your New Orleans office furniture. Remember that if you want to add guest chairs, a book shelf or a filing cabinet, that that will reduce your available footprint. Also take into consideration the doors in your office and how they open to avoid collisions. What shape desk is best? 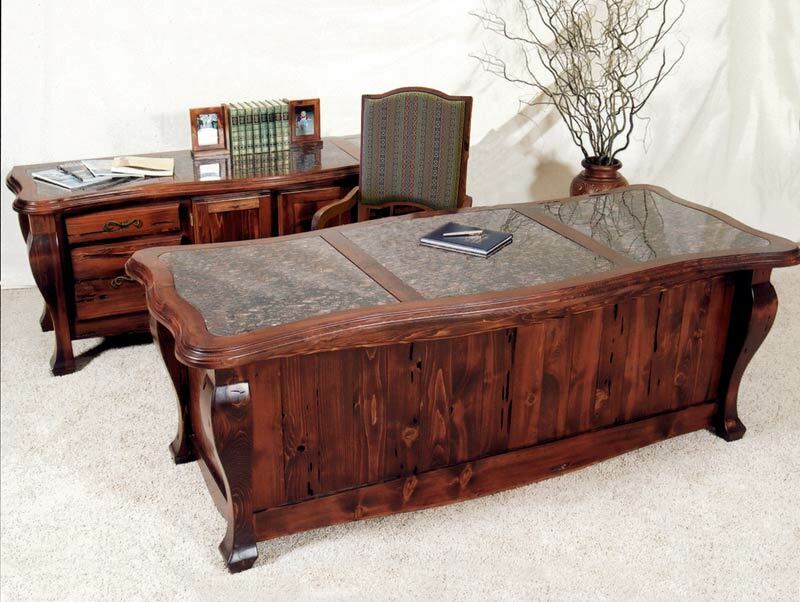 You can always go with a straight looking executive, but also consider an L-shaped, U-shaped or double pedestal desk. An L-shaped or double pedestal desk will fit well in a small office, while a U-shaped desk is perfect for larger offices and instances where more surface area is needed or workspace will be shared. Don’t ignore corner desks – they can fit neatly in your space and are great if you don’t need client meeting space integrated. Know your storage needs and the prospective desk’s storage options. Is there a hutch, a bookshelf, or but in cupboards? You should pick a desk that has enough storage to handle your needs. You can also purchase a set with a desk and a separate hutch or shelving to make storing items neatly and out of the way a possibility. The style or finish is the final consideration. 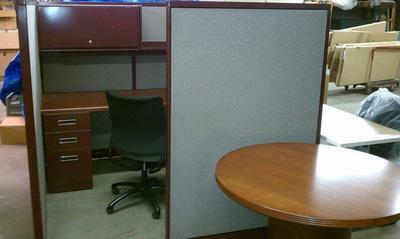 When buying New Orleans office furniture, you may want to match existing pieces. If not, go with your gut – will dark cherry or mahogany look better, or are you better off with a pine or maple finish? The desk you choose should be something you will be happy with for a long time, as a new desk is an investment! Make the right choice!